I have received a lot of requests for tips and tricks to organize your purse, or backpacks and briefcase. I have put together a step by step video for you to follow. It will take you less than 5 minutes to organize your purse and the impact will improve your whole day! This is my absolute favorite time of the year! As many of you know I am from the States originally and Thanksgiving was always my favorite holiday. I love to eat and I love to be around my friends and family. It always kicked off the holiday season and all of it’s magic! With it coming up next week, I know the holiday rush is close behind. I want you to have the best holiday season you can. Whatever you celebrate or decorate or get together with family and friends for it all takes the same groundwork and organizing to be enjoyable! Knitters listen up. I have been working in a home the last few weeks with an avid knitter. Or maybe I should say an avid yarn collector. Yarn is fun. It comes in every shade of the rainbow. You can create unique pieces that keep your loved ones warm. I get it! I’ve been learning to crochet for the past year; I’m confident one day it will just click! When you buy a comforter it usually comes in a big plastic zipper bag. Keep your larger projects together and all yarn and needles needed to work on it. Good ol’ Martha, always so clever. I love her idea to use old tins with a hole in the top. It keeps your yarn in order AND gives you something to do with old cookie tins, the holiday’s are just around the corner. Wrap leftover remnants of yarn around clothespins to keep them from turning into useless balls of clutter. Clip the end of the yarn into the clothespin and they’re ready when you need them. This also works well with embroidery floss. 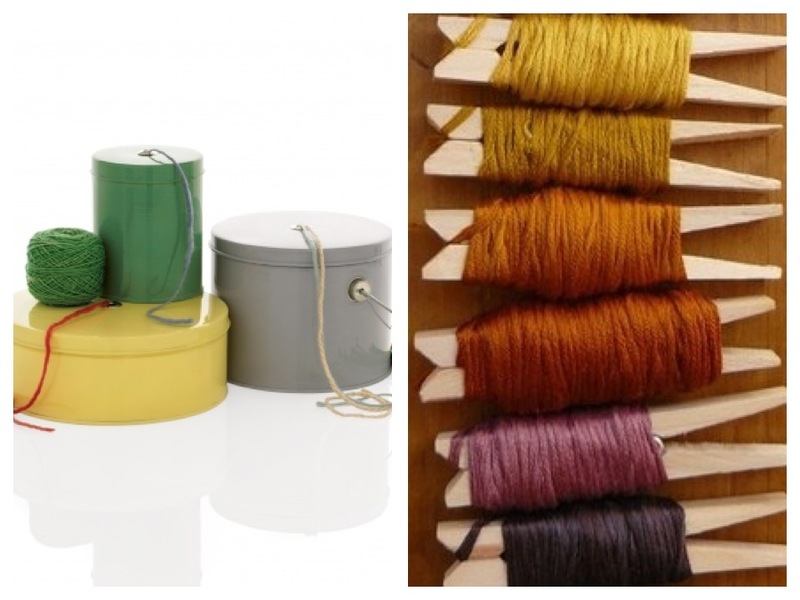 Give yourself a physical boundary for your yarn collection, a bin, a basket or a bag. Whatever it is, once you reach the limit do not buy any more yarn until you have used some or passed it along for someone else to use. If you need a place to donate yarn you are no longer using and you live in Toronto donate to Artsjunktion. They are a wonderful place for students and teachers of the Toronto School District to get free art supplies for projects and classes.